Australian Defence Minister Senator Marise Payne and Minister for Foreign Affairs Julie Bishop alongside Japanese counterparts Foreign Minister Fumio Kishida and Defense Minister Tomomi Inada. 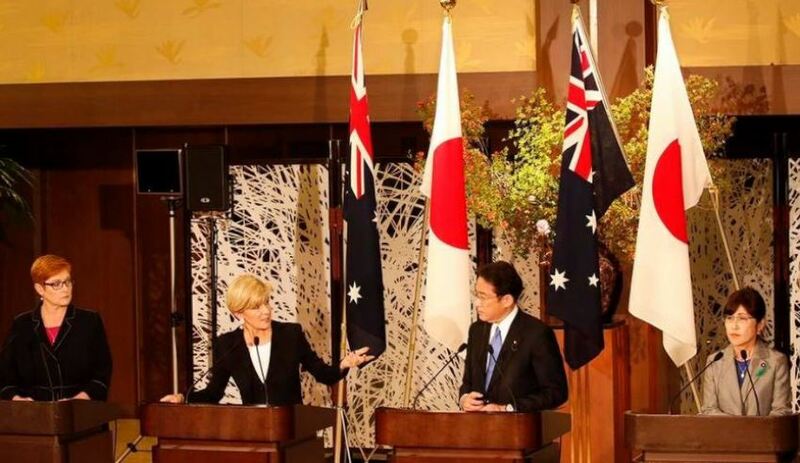 Minister for Foreign Affairs Julie Bishop and Minister for Defence Marise Payne travelled to Japan this week to advance Australia's relationship with its “closest strategic partner in Asia”. The ministers participated in the seventh Australia-Japan 2+2 Foreign and Defence Ministers’ Meeting with Japanese counterparts, Foreign Minister Fumio Kishida and Defense Minister Tomomi Inada. In a joint statement, the Australian ministers said they "welcomed the closer engagement between Japan and Australia since the sixth 2+2 meeting, including Prime Minister Abe’s visit to Australia in January 2017", and they "reaffirmed their determination o further enhance the special strategic partnership between the two countries, founded on common values and strategic interests including democracy, human rights, the rule of law, open markets and free trade". In response to the growing threat of a hostile North Korea, Japan has sought to expand its defensive role and capabilities. The minister's statement said they reiterated condemnation in the strongest terms of North Korea’s nuclear tests, multiple ballistic missile launches and proliferation activities, and they strongly urged North Korea to cease its destabilising and provocative actions immediately and to fully comply with its international obligations and commitments, including those under relevant United Nations Security Council resolutions. They also welcomed the unanimous adoption of UN Security Council Resolution 2321 and emphasised the importance of enhancing pressure on North Korea through full, thorough and sustained implementation by member states of all relevant UN Security Council resolutions, including Resolutions 2270 and 2321. They strongly urged North Korea to end its human rights violations, to resolve the abductions issue immediately and to focus on the great unmet needs of the people of North Korea. At the meeting, the ministers reaffirmed their commitment to further enhance trilateral co-operation between Australia, Japan and the US, underlining the importance of the Trilateral Strategic Dialogue and the Trilateral Defence Ministers’ Meeting. This comes on the back Malcolm Turnbull's recent visit to India and his speech at the National Defence College. The ministers also welcomed the signing of the 2016 Trilateral Information Sharing Arrangement as one of the concrete outcomes of the Security and Defence Cooperation Forum. While in Japan, Defence Minister Payne had to address rumours of lingering tension from Japan over missing out on the mulit-billion dollar contract to French company DCNS to build Australia's Future Submarines. Senator Payne told reporters on Thursday that Australia and Japan were only focused on future opportunities for defence co-operation and that "we are more than capable of moving on". In August last year when DCNS were announced as the winner of the contract, Japan's then defence minister Gen Nakatani told Reuters the Australian government's decision was "deeply regrettable" after former prime minister Tony Abbott made an informal agreement with Prime Minister Shinzo Abe to award the contract to Japan.